Photography for me is about learning to see what often goes unseen. I’m drawn to subjects that are transitory, where it’s easy to miss what’s right before your eyes. I like the sense of mystery, that there’s more to be found if I just keep exploring, keep playing with image making. I like not having total control over an image and that luck plays a role in what I do, but that as I photograph the same subject over and over, the role of luck diminishes and the knowledge and skill I bring increase. I love the sense of wonder and joy when something completely unexpected appears in an image I’ve made. I hope my images help people see a side of things they’ve never noticed before. Two boys walked past me on the beach one day and I heard one tell the other, "There's too much water." It struck me then that while the boy was looking at the ocean and the waves, he was perhaps not truly seeing them. The vastness of the ocean and the speed at which the waves formed and dissipated made it hard to perceive the incredible range of patterns, forms, and textures present. The images in Rhapsody are from a yearlong journey learning to see what often goes unseen when people look at waves. As I returned time and again to the same places, and as the tide, weather, and light changed, I began to see the many faces of waves and experience the wide range of moods they can evoke. From high energy chaos or primordial power that left me awe-struck, to playfulness or dancing that made me laugh, to a quiet grace or near stillness that surrounded me with a sense of solitude and peace. No two waves were ever exactly the same and none lasted more than a few seconds, yet another wave always followed, with its own surprises and wonder. Picture, if you will, a harbor. Where do your eyes go? To the tall ships? The lobster boats? Mine go down to the water. Always moving. Reflecting everything around it. I sit, watch, wait. Photograph. Again and again I return to the same spots, and what I see, how I see, gradually changes. And the images I create change as well. Glimpse is a collection of images that go beyond literal reflections to capture what seem like split-second views into other worlds. What they depict is not real in our world, yet feels like it could be real elsewhere, or perhaps an idea for a story yet to be written. Spend time in any active harbor and you’ll see lines wherever you look. From halyards for hoisting sails to mooring lines used to tie boats to docks. From the edge of a boat’s gunwale to the railing and grate-like surface on a gangplank. All are common, everyday objects. Look down in the water, though, and a bit of magic happens. The reflections of those lines might start off looking just like their sources, but add a breeze, the wake from a boat, raindrops, or a duck dipping below the surface for food, and the reflection is disturbed. It curves, stretches, seems to vibrate. There’s rarely just one line and their reflections meet, merge, and just as quickly diverge. Shapes and patterns are formed, lasting only for a brief moment. 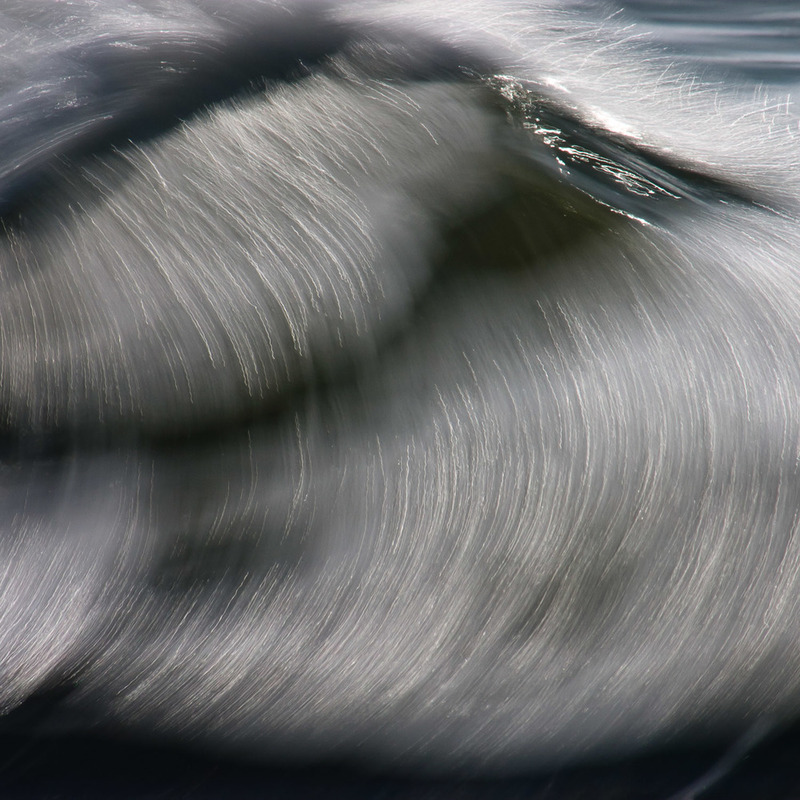 The images in the Line gallery are an exploration of what can happen when everyday lines, reflected in moving water, are transformed into something else altogether. The sources of the images are lines, and the images themselves are made up of lines. But those beginning and ending lines are very different. And what started as everyday is now far from ordinary. My ideas for new bodies of work often arise long before I actively start working on them. Sometimes those ideas are the result of a deliberate thought process; other times they happen when I’m just playing with the camera and am delighted by an unexpected image. Either way, they always start with a photograph or two I made that stick in my mind. If I find myself returning to them time and again, they become a reminder, a promise to myself to one day explore in earnest what it was about them that resonated with me and see whether I can build a body of work around them. The images in the Beginning gallery are the ones that are sticking in my mind these days. These early favorites might or might not end up in any “final” bodies of work, but they are the seeds of thought that motivate my explorations.